Robert Lacey is a British historian noted for his original research, which gets him close to – and often living alongside – his subjects. He is the author of numerous international bestsellers. After writing his first works of historical biography, Robert wrote Majesty, his pioneering biography of Queen Elizabeth II. Published in 1977, Majesty remains acknowledged as the definitive study of British monarchy – a subject on which Robert continues to write and lecture around the world, appearing regularly on ABC’s ‘Good Morning America’ and on CNN’s ‘Larry King Live’. In 2002, the Golden Jubilee Year of Queen Elizabeth II, he published Royal (Monarch in America), which was hailed by Andrew Roberts in London’s Sunday Telegraph as ‘compulsively readable’, and by Martin Amis in The New Yorker as ‘definitive’. 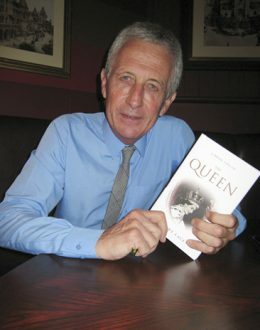 In 2012 Robert brought readers up to date with A Brief Life Of The Queen, a slim volume successfully intended to stand out for its brevity at the time of the Queen’s Diamond Jubilee. The Kingdom, a study of Saudi Arabia published in 1981, is similarly acknowledged as required reading for businessmen, diplomats and students all over the world. To research The Kingdom, Robert took his family to live for eighteen months beside the Red Sea in Jeddah. Going out into the desert, this was when Robert earned his title as the ‘method actor’ of contemporary biographers. In the aftermath of 9/11, Robert returned to Saudi Arabia to research the Islamic Awakening there for a new book Inside The Kingdom. Much acclaimed for its balanced insights and fluency, this 2009 publication was an account of Saudi life and history from 1979 to 2009, told through the personal experience and memories of Saudis. Following the many & varied bestsellers you can browse in these pages, Robert returned to his first love, history, with his trilogy, Great Tales from English History – the first narrative history of England (and to some extent Britain) written in and for the 21st century.